Durham Region in Ontario is big (about 2500 sq km) and diverse as it covers truly rural areas as well as the cities of Pickering, Ajax, Whitby, Oshawa and Bowmanville. I can see why this region merits its own police force. I had the opportunity, for sad reasons, to drive the countryside between Ajax and Keswick. I could have taken the big highways (401, 404, etc.) but I wasn’t exactly in a big rush to head to a memorial service and Google Maps suggested that the highway route was the almost the same duration as the rural roads. 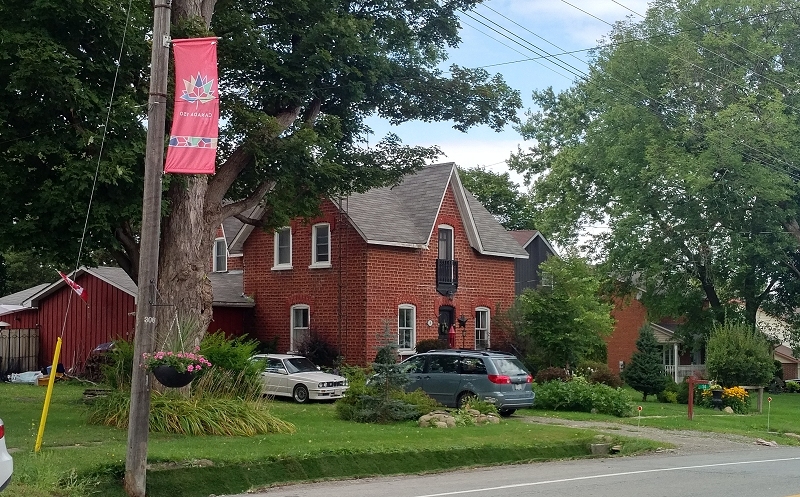 If you come from British Columbia, you tend to think of Ontario as fairly flat, but as I drove north from Ajax on Lake Ridge Road (also known as Durham Regional Rd 23) the terrain became suitably rolling with picture-perfect farm houses. There was even signage for the Dagmar Ski Resort, which looked kind of basic given my Whistler mindset, but what the heck. Of course, it was summer when I was driving and it had been a wet one and the trees were lush and green with lots of new growth. If you’re thinking downtown Toronto as a start point, it’s about 60 km of urban driving to reach this part of rural Ontario. Over the years the urban sprawl used to have a no-go line of Highway 7, but with the increasing size of the 407 highway (which has tolls – beware rental car drivers) I see this greenery more and more at risk of being suburb-ized. In my view, enjoy it while you can! For example, at the side of the road, I observed this big, big crow and, as I was thinking, “there’s no way that’s a crow”, I realized it was a turkey vulture. I assumed it was drawn to road kill. I’d seen some flying high with their slightly upturned wing tips, but I’d never seen one standing on the shoulder! Some of the place names on this route are quite funny. I turned onto Ravenshoe Road. I didn’t know ravens had shoes. “East Gwillimbury” sounds like a place name in a Monty Python sketch. Also, as far as I can tell, there is no Gwillimbury one could reasonably be east of. My favourite was the Hamlet of Udora. This sounds like something from Harry Potter. I stopped for a couple of reasons, including most practically, gas for the car. Udora’s gas station was a UPI Energy (never hear of it) and had the total charm of it being entirely full service. There was no pump-your-own gas option. 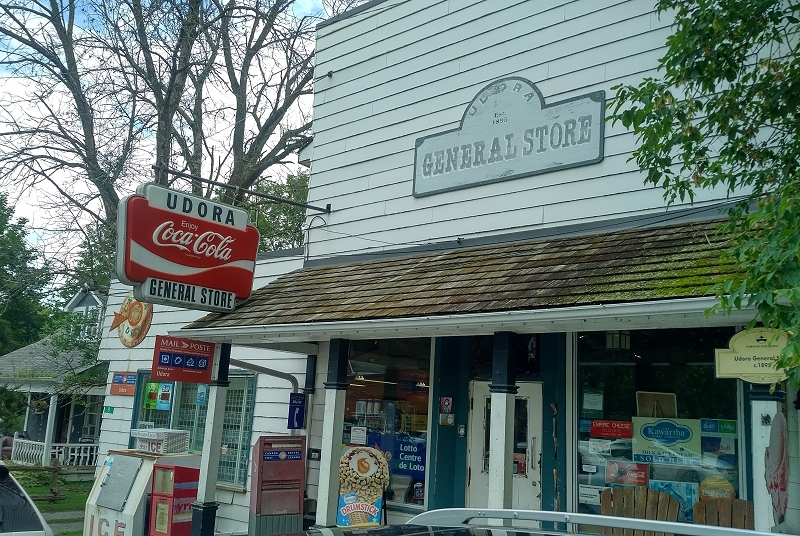 I had a chat with a friendly teenager who pumped the gas and then made my way to the Udora General Store. Honestly it was rustic and had DVDs for rent for that extra retro feel. In addition the Udora General Store was the post office for the entire town, er, hamlet. Apparently, it is one of the few remaining places where you address the mail as General Delivery. Across the street was a lovely brick home. However, a number of dump trucks were loudly heading north and, despite having no idea what they were doing, they were for me a symbol of urban encroachment. So, I ask, how many more architecturally uninspired subdivisions can we handle? A bit of bad navigating on the way back from my sombre mission led me through Uxbridge. (For you Monty Python fans, do an Internet search for “Climbing The North Face of The Uxbridge Road”.) On the way out of Uxbridge, I found this farm house that to me represents the countryside that we should all be cherishing.